What a great piece, Deb. 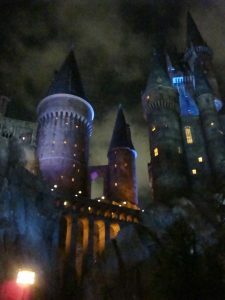 The Harry Potter stories have always been about more than entertainment, and you’ve managed to remind us of their relevance at a time when it’s important to keep those messages in mind. Thank you. Thank you, LynneRose! Sometimes it’s truly surreal when we watch the evening news and can immediately associate current events with scenes/lessons from these stories. It’s frightening at times, but I have hope that insight like that of Harry and the others exists off the page as well as between the covers. Thank you for coming by! Terrific column, Deb. The children’s books that stay with us through life are the ones that grapple with the problem of good and evil and the courage needed to face up to that problem. Thanks for this. Thank you, Lil! I agree about the books that stay with us through life being those that grapple with good and evil – but I’d add that if they explore the overlap of good and evil, they touch an even deeper place within us, making us think longer and harder. The books that even make us uncomfortable with our own assumptions or assertions are even better. Honestly, every time I read one of these books again – or watch the movies again – I see and feel something new. Happy you liked this post! Thank you for coming by! It’s been 27 years? Oy! lol That’s for putting out a fine piece in tribute to the Harry Potter series. It’s hard to believe it’s been that long isn’t it? Daniel Radcliffe (Harry) turned 29 about a week ago. He’s a MAN now. Insane. And the character, Harry, is now 38. That’s older than I was when I was first introduced to the series! It’s crazy how much time has gone by, how much life has changed since then and yet…how parts of it have remained the same. Here’s hoping a majority of our kids have been changed in positive ways.